Directed by Jodie Foster. Produced by Lara Alameddine, George Clooney, Daniel Dubiecki, and Grant Heslov. Written by Jamie Linden, Alan Di Fiore, and Jim Kouf. Release date: May 13, 2016. Last year, we saw the release of The Big Short, an angry little movie about the real-world financial crisis that was the worst economic downturn since the Great Depression. Millions suffered, either through job loss or eviction, and it took us years to recover - and one could argue we still haven't. Money Monster, on the other hand, focuses on a significant drop in a single fictional stock that lost fake people $800 million. For some reason, it feels insignificant when compared to The Big Short - and since they've been released within months of one another, such comparisons are inevitable. We don't live in a vacuum. 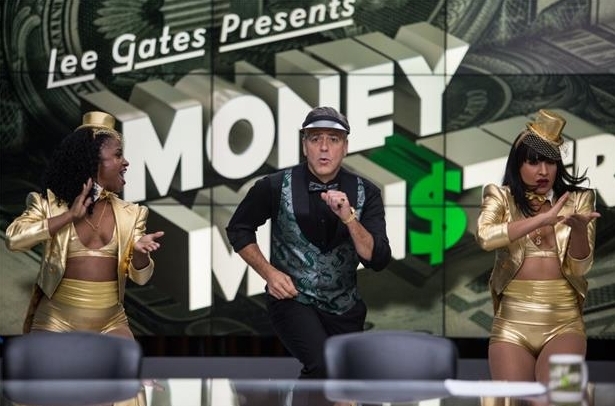 The film follows, in real time, a hostage situation on "Money Monster," a financial advice show hosted by one Lee Gates (George Clooney). One day, following the aforementioned stock drop, a delivery man named Kyle Budwell (Jack O'Connell) appears on the show with a gun and a bomb vest, demanding answers. Gates backed the stock, so it's partly his fault, you see. Why'd the stock fall in the toilet? Where is the company's CEO, Walt Camby (Dominic West)? Is there something bigger going on, or should the carelessness with which Gates throws around advice be curtailed? Of course there's something larger to the film; its tagline is "not every conspiracy is a theory," after all. So, while we have to deal with the minute-to-minute tension that comes from a hostage situation, we also have to work toward unravelling what is ultimately not a particularly satisfying mystery. Greed isn't good after all. The minute-to-minute stuff is good, if repetitive. George Clooney's Lee Gates is the type of smug, pompous guy who probably does deserve a slap in the face, even if you don't necessarily want to see him blown to smithereens. 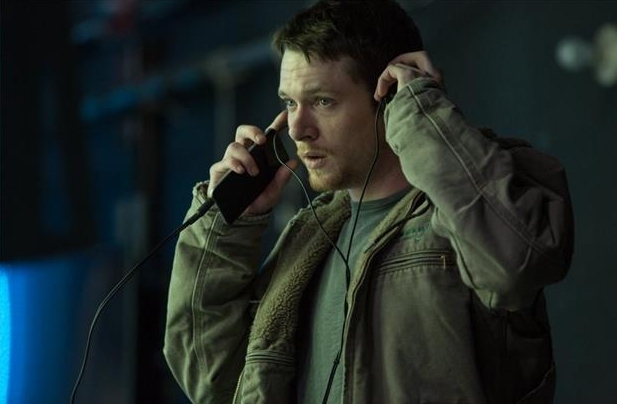 Jack O'Connell's Kyle is perfect as an angry man with a plan - but not a plan that's entirely thought all the way through. Julia Roberts plays Patty Fenn, the show's director, and she and Clooney continue to have some of the best chemistry in the movies. Things could go south at any moment, and the three characters need to navigate themselves through a situation which could have an explosive conclusion. Given the talent involved and the timely subject matter, it's not unreasonable to expect Money Monster to be better than it is. However, as we build to the "conspiracy" - which is blatantly obvious and won't surprise anyone, certain things don't quite work. Gates and Kyle begin to work together in an absurdly tight time frame, for one. Stockholm syndrome doesn't usually set in that quickly. The real villain is nowhere near as interesting as the moment-to-moment interactions of our primary cast. And while Money Monster certainly has its points to make about the world of finance, none of them register strongly. They're not shocking. At least, not anymore. If Money Monster was a mid-90s film, sure. There is enough here to appreciate, though. Jodie Foster directed, and she balances a fine tonal balance. 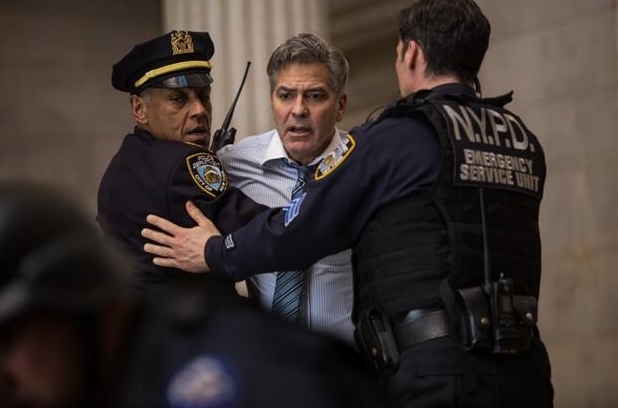 Money Monster is a comedic thriller, and sometimes showcases both aspects in a singular scene. Emily Meade's cameo, and its aftermath, features both. This is a tightly paced film, running for 98 minutes and stuffing a lot into that time frame. George Clooney and Julia Roberts are both solid. Jack O'Connell's accent is distractingly bad, but the performance otherwise is fine - a great blend of desperation and "something's up" smarts. Much of it is tense, with the audience wondering if things could explode - literally - at any moment. Given the talent involved and the timely subject matter, it's not unreasonable to expect Money Monster to be better than it is. It's not a great movie. It's just okay. It does a lot of things right - it's well-paced, features good performances, and balances its comedic and thriller aspects well - but falters in trying to tie its angry themes onto its hostage plot, and in being way more predictable than it likely should be. It'd be a smart movie if made in the '90s; in 2016, it simply doesn't feel as intelligent or consequential as it should. 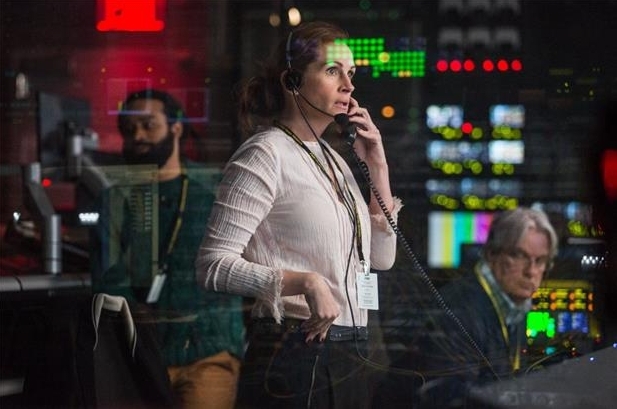 In a world containing The Big Short, Money Monster simply falls short. 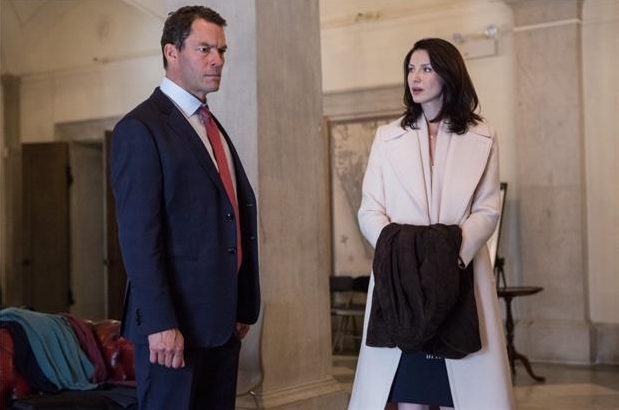 Bottom Line: Disappointing but not out-and-out bad, Money Monster isn't quite worth the investment. 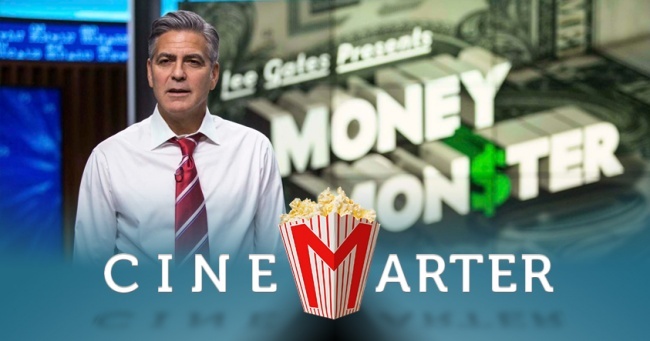 Recommendation: Money Monster is a rainy afternoon type of movie.